Organic award-winning olive oil with an outstanding taste. This award-winning organic olive oil consistently has the perfect combination of lightness in quality and richness of flavour. 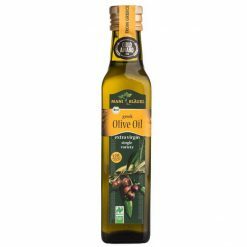 With its ultra-low acidity, fruity taste and ever so slightly spicy tang, it is the ideal oil for salads and other fresh dishes. Artisan producers Mani-Bläuel offer the highest quality olives and olive oil from the Mani area, on Greece’s Peloponnese Peninsula. The rocky, mineral-rich soil and sunny, dry climate provide the ideal growing conditions for the indigenous olive variety, Koroneiki. The noble olive tree and its fruit played a significant role in the Bläuel family’s decision to settle in the area in the 1970s. In co-operation with local farmers, Fritz and Nurgi Bläuel created a mild, fruity version of the region’s Koroneiki olive oil, which has gained appreciation by consumers and experts alike. Mani Bläuel supports the preservation of the physical and cultural landscape of Mani, helping in its establishment as the centre of Greece’s organic olive cultivation. All products are produced in close cooperation with organic farmers, who Mani Bläuel has supported for many years. The company has received a Fair Trade Certification from organic food labelling non-profit organisation Naturland. As part of this certification, Mani Bläuel follows seven principles: social responsibility, reliable trade relations, fair prices, regional supply of raw materials, collaborative quality assurance, community involvement and corporate strategy and transparency. Olive oil is the only oil for which three health properties have been recognised by the European Food Safety Authority. It is rich in vitamin E, which protects cells from oxidative damage that can cause inflammation and degenerative processes, from ageing to cancer. It consists of mainly monounsaturated and polyunsaturated fatty acids. By consuming these rather than saturated fatty acids, normal LDL cholesterol levels in blood can be maintained. Also, it presents high levels of polyphenols, which are natural anti-oxidant substances that protect cells from free radicals and inflammatory agents.